Material: 100 % polyester (approx. 200 g/m²). 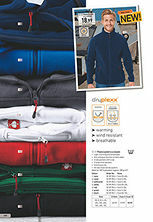 Textiles dryplexx® micro are incredibly lightweight and warming. 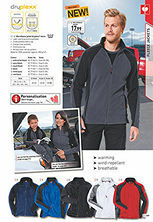 The material is wind resistant and protects against chills and draughts. The pockets of air that collect in the fleece pile are highly suited to provide insulation, thereby regulating the climate.